The denim background is from the Daisytrail Materials freebie. The heart pins and button surround is from Pam Lefors. The othe images are from Debbie Moore's Haberdashery CD. 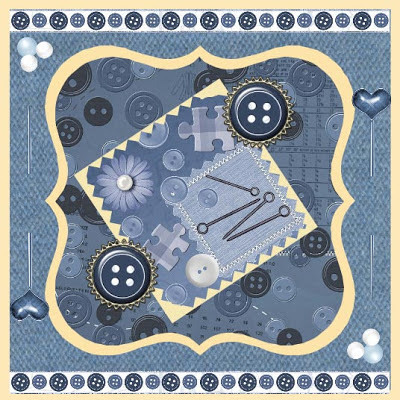 I love all the sewing images that make up your design. Very effective. A lovely collage effect Caroline and just right for this weeks challenge. Thank you for joining in the CD Sunday challenge this week. Great take on our theme this week Caroline, i have this cd, lots of lovey images on it. Hi Caroline. I love all the bits and pieces on your card. Enough to get started on making a pair. Afraid my jeans wearing days are over. Thank you for joining in with us . A super card Caroline, I love your design. Everything works so well together. I must have missed this particular Freebie from Daisytrail.